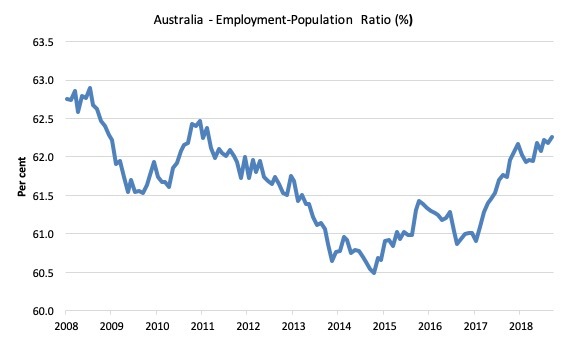 Today, the Australian Bureau of Statistics released the latest data – Labour Force, Australia, October 2018 – which show that the Australian labour market really was treading water despite the improvement in employment growth, from last month’s outcome where Australia endured zero growth. The moderate employment growth, however, trailed behind the growth in the labour force and unemployment rose a bit. Monthly hours worked remained on a flat trend. The labour market remains in a fairly weak state – the growth in employment is not sufficient to match the growth in labour supply and the broader measures of labour underutilisation remain at persistently elevated levels. 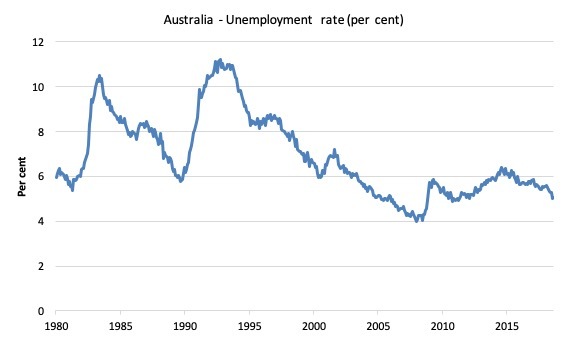 The Australian labour market remains a considerable distance from full employment. There is clear room for some serious policy expansion at present. 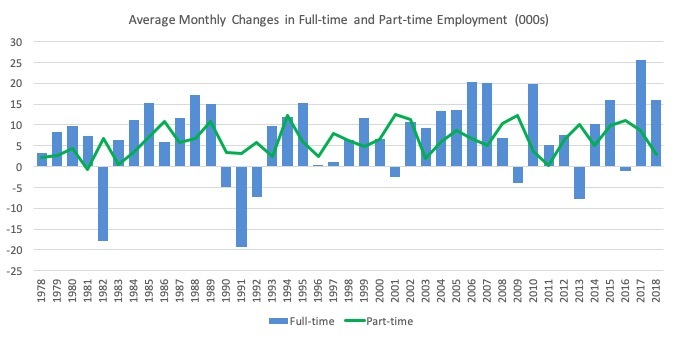 Employment increased 32,800 (0.03 per cent) – full-time employment increased 42,300 and part-time employment decreased 9,500. Unemployment increased 4,600 to 672,100. The official unemployment rate remained steady at 5.0 per cent. The participation rate increased by 0.1 points to 65.6 per cent, and remains well below its previous peak (December 2010) of 65.8 per cent. 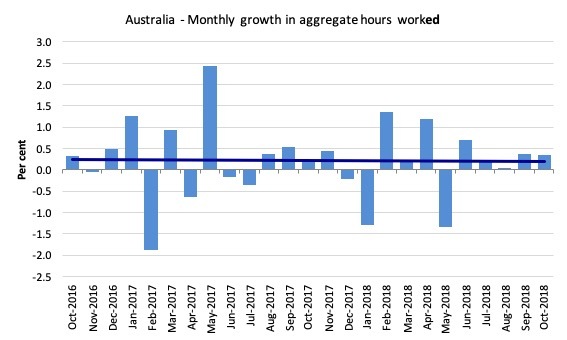 Aggregate monthly hours worked increased 6.1 million hours (0.3 per cent). The monthly broad underutilisation estimates for October 2018 show that underemployment was steady at 8.7 per cent (1,105.5 thousand). 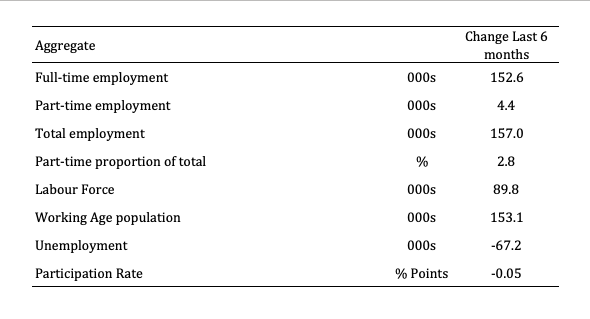 The total labour underutilisation rate (unemployment plus underemployment) was 13.3 per cent. There were a total of 1,777.5 thousand workers either unemployed or underemployed. Employment growth was stronger this month after a very weak growth figure in September. 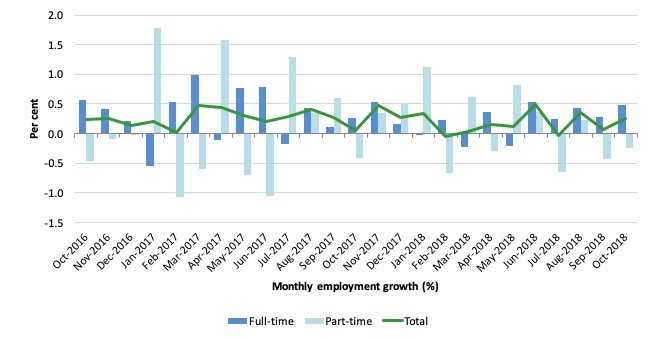 Total employment rose by 32,800 (0.3 per cent) – full-time employment increased 42,300 and part-time employment decreased 9,500. The moderate employment growth, however, trailed behind the growth in the labour force and unemployment rose a bit. The following graph shows the month by month growth in full-time (blue columns), part-time (grey columns) and total employment (green line) for the 24 months to October 2018 using seasonally adjusted data. 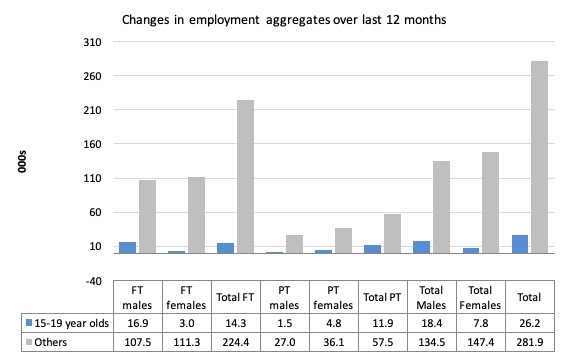 Overall there have been 152.6 thousand jobs (net) added in Australia over the last six months while the labour force has increased by 89.8 thousand. The result has been that unemployment has fallen by 67.2 thousand. 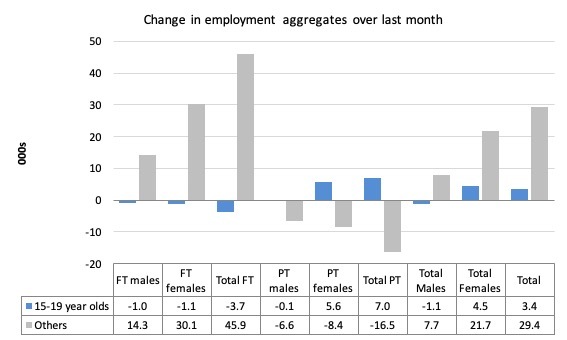 These aggregate changes signify a moderate labour market performance given that the decline in unemployment has also been driven by the weak labour force growth (drop in participation of -0.05 points). The ratio rose by 0.1 points in October 2018 to 62.3 per cent and remains well below pre-GFC peak in April 2008 of 62.9 per cent. 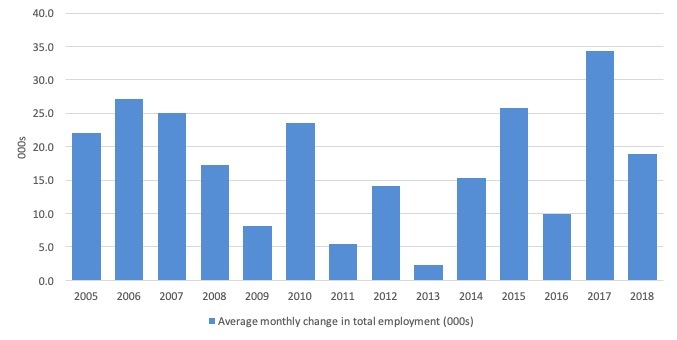 To put the current monthly performance into perspective, the following graph shows the average monthly employment change for the calendar years from 2005 to 2018 (the 2018 result is up to October 2018 only). It is also clear that the labour market has weakened considerably in the first 10 months of 2018. Total teenage employment rose by 3.4 thousand jobs in October 2018 with full-time teenage employment falling by 3.7 thousand and total part-time employment rising by 7 thousand. Over the last 12 months, teenagers have gained 26.2 thousand (net) jobs overall while the rest of the labour force have gained 281.9 thousand net jobs. Teenagers have gained around 8.5 per cent of the total net employment growth over the last 12 months but represent around 7.3 per cent of the total labour force. So they are doing slightly better when we take scale into account. 1. 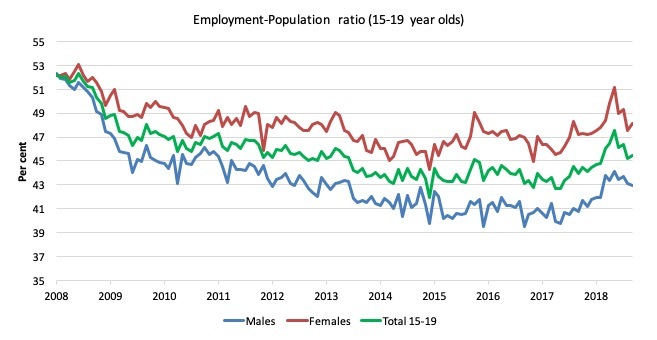 Since February 2008, there have been 2024 thousand (net) jobs added to the Australian economy but teenagers have lost a 71.9 thousand over the same period. 2. Since February 2008, teenagers have lost 101.2 thousand full-time jobs (net). 3. Even in the traditionally, concentrated teenage segment – part-time employment, teenagers have gained only 29.3 thousand jobs (net) even though 961.4 thousand part-time jobs have been added overall. The male ratio has fallen by 9.4 percentage points since February 2008, the female ratio has fallen by 4 percentage points and the overall teenage employment-population ratio has fallen by 6.8 percentage points. In October 2018, the participation rate was 54.8 per cent (down by 0.2 percentage points). However, the difference between the 2008 level, amounts to an additional 90.1 thousand teenagers who have dropped out of the labour force as a result of the weak conditions since the crisis. If we added them back into the labour force the teenage unemployment rate would be 25.2 per cent rather than the official estimate for October 2018 of 17 per cent. The official unemployment rate remained steady at 5.0 per cent in October 2018 and increased 4,600 to 672,100. The following graph shows the national unemployment rate from January 1980 to October 2018. The longer time-series helps frame some perspective to what is happening at present. 1. It is still 0.1 points above the level it fell to as a result of the fiscal stimulus and 1 point above the level reached before the GFC began. 2. The total labour underutilisation rate (unemployment plus underemployment) was steady at 13.3 per cent. 3. There were a total of 1,777.5 thousand workers either unemployed or underemployed. 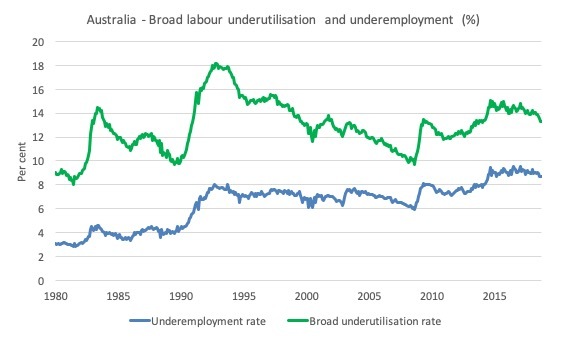 The following graph plots the seasonally-adjusted underemployment rate in Australia from January 1980 to the October 2018 (blue line) and the broad underutilisation rate over the same period (green line). 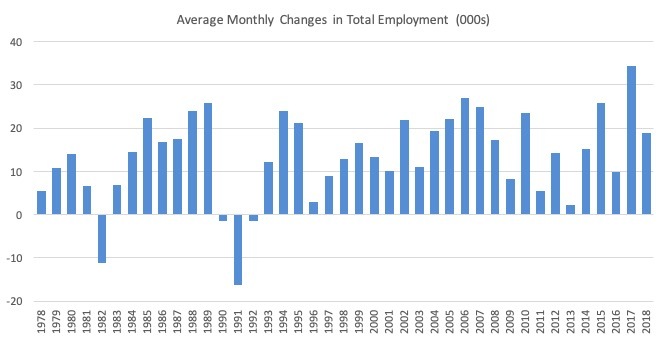 The October data shows that employment growth improved from a zero state in September and repeated the zig-zag pattern around zero growth then positive growth. Monthly hours worked remained on a flat trend. 1. The labour market remains in a fairly weak state – the growth in employment is not sufficient to match the growth in labour supply and the broader measures of labour underutilisation remain at persistently elevated levels. 2. It remains a considerable distance from full employment. I enjoyed your podcast with Patricia Pino and Christian Reilly. Thanks. I get that you are working from a template to save time, but I’m not sure that “well below” is the correct commentary anymore…also I think that high was November 2010 (probably revised). Finally, I think we closed in on the recent high p/r at the start of the year and have been around the mark ever since.